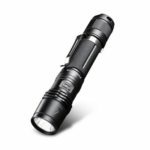 This Rechargeable LED Flashlight is perfect for working, outdoor camping, emergency, repair, and daily use. 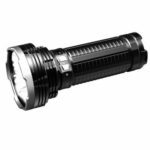 It utilizes a CREE XML2 U2 LED with a maximum output of 600lm, bringing super brightness. Made of high quality aluminum alloy material, durable in use. Compact but powerful, convenient to carry everywhere. Adopting XML2 U2 LED light, with up to 600lm high brightness and long service time, to light up your way in the dark. Two kinds of mode group, group 1 (5%low-40%mid-100%high)/group 2 (5%low-40%mid-100%high-100%Strobe-100%SOS) for you to choose, great to meet your different demands. 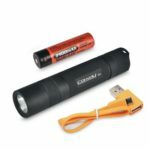 Comes with a 3400mAh rechargeable 18650 battery which can also discharge as a power bank. Connecting the battery with the included cable, it can be used for charging cell phone, tablet and other electronic devices. It can memory the mode next time when turn on for more than three seconds. If less than 3 seconds, it will goes into next mode. 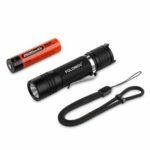 When the voltage of battery is 2.9-3.1V, the flashlight flashes 2times/sec with low brightness for alarm. If your battery is reversed, it will not bright only, do worry about battery or circuit. Adopting high quality aluminum alloy material, durable and stable. 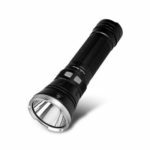 Compact and lightweight, fits well in your hand or pocket, portable to carry everywhere. 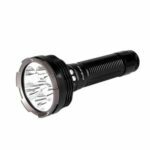 It is multifunctional and suitable for outdoor cycling, hiking, camping, fishing, working, repairing and daily use.